Home / Announcements / BlackBerry KEY2 First Look: Oh Boy. 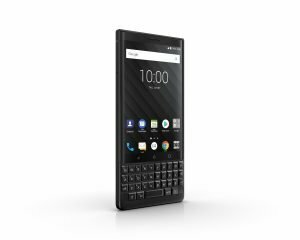 Starting off, BlackBerry managed to make the KEY2 feel completely different to the KEYone, whilst also making it feel more like a BlackBerry than ever before, They actually told us one of the things they worked on was the keyboard feel. 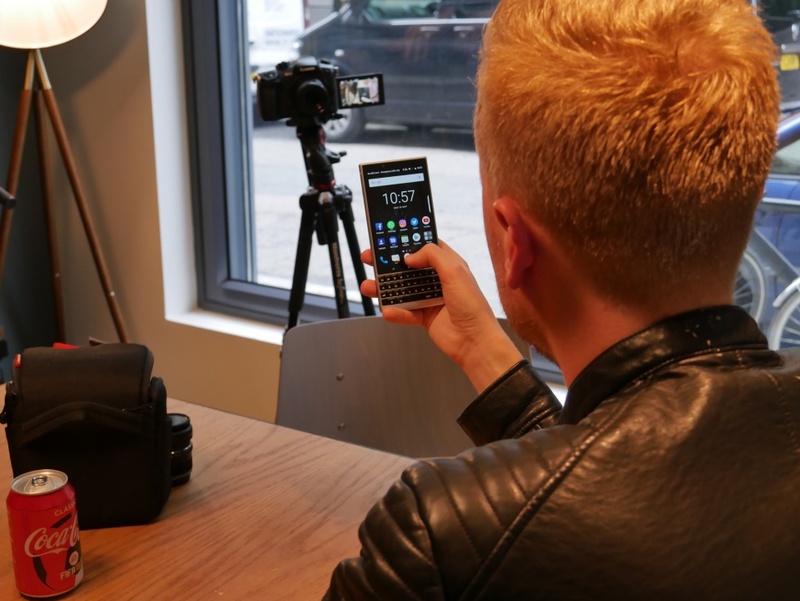 Despite having what I think is one of the best keyboards in recent memory, BlackBerry wasn’t content with sticking with the keyboard on the KEYone, so they did blind typing tests with various KEY2 devices and a Bold 9900, the BlackBerry with one of the highest rated keyboards according to BlackBerry, and they got it close enough that even the internal engineers couldn’t tell them apart, now that is impressive. So what is different about the keyboard? Well, for starters, it’s larger, substantially larger actually. Each key is 20% larger than their respective key on the KEYone, this was made possible by shrinking the forehead and moving the screen upwards (though, it could also be said that switching to on-screen buttons would have meant they’d be able to make the keys even bigger). They also tweaked the angle of the keycaps, and, most importantly, the keys are now matte, no longer glossy, meaning that grip is improved, as well as aesthetics. 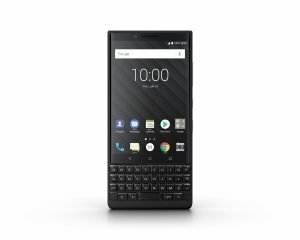 Speaking of new things on the keyboard, you may have noticed a new key where the right shift button used to be, this is what BlackBerry calls the “speed Key” and basically it takes what BlackBerry did with keyboard shortcuts on the KEYone, jabs it with some steroids and makes it system-wide. No Matter where you are in the OS, holding the speed key and tapping W will take you to WhatsApp (or whatever you have set for W), Hitting “I” would take you to Instapaper, or Instagram or once again, whatever you have set “I” to be. This feature is actually direct consumer feedback. 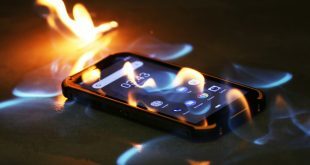 I spoke to a few key software developers at BlackBerry Mobile, and they stated the reason they even had a speedkey, is because users (one of which was me) wanted to use keyboard shortcuts, but didn’t want to use the BlackBerry launcher, what we got was more than we bargained for but in the best way possible. 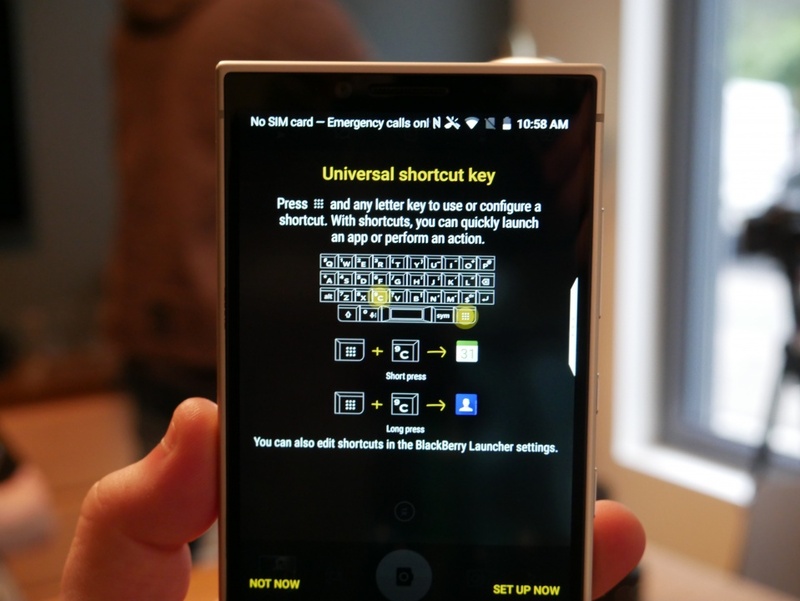 Other than the keyboard, BlackBerry took on board user feedback on the in-hand feel of the device. Whilst a lot of people liked how well built the KEYone was, some weren’t a fan of how thick and hefty it was, so with the KEY2, they shaved 12g off of the weight, 1mm off of the thickness, and squared off all the corners with bevelled/chamfered edge. I was actually okay with the weight of the KEYone, but I do much prefer the blockier aesthetic of the KEY2 over the KEYone. It looks more professional and is also, I think, more comfortable. 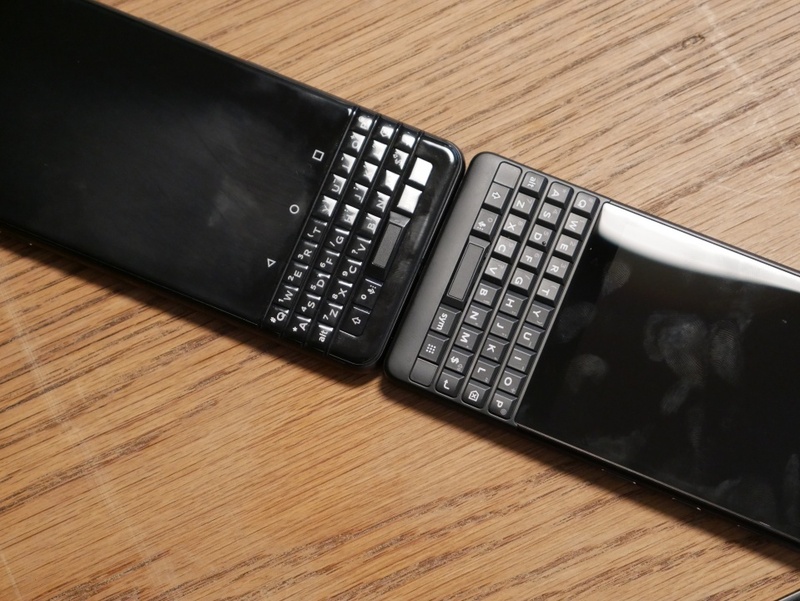 Speaking of aesthetics, the KEY2 will come in Silver and Black from Day 1, which is great news for those of you that want a stealthy device (Black) or one that lets everyone know you have a BlackBerry, like me. 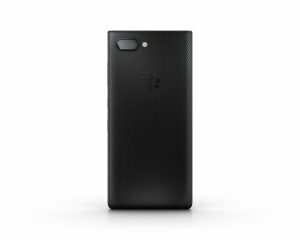 Flipping over to the back we are a slightly redesigned rear, the soft touch rubbery plastic has been swapped out for a slightly textured soft-touch plastic that sits flush with the rear, and doesn’t wrap around the edges like on the KEYone. 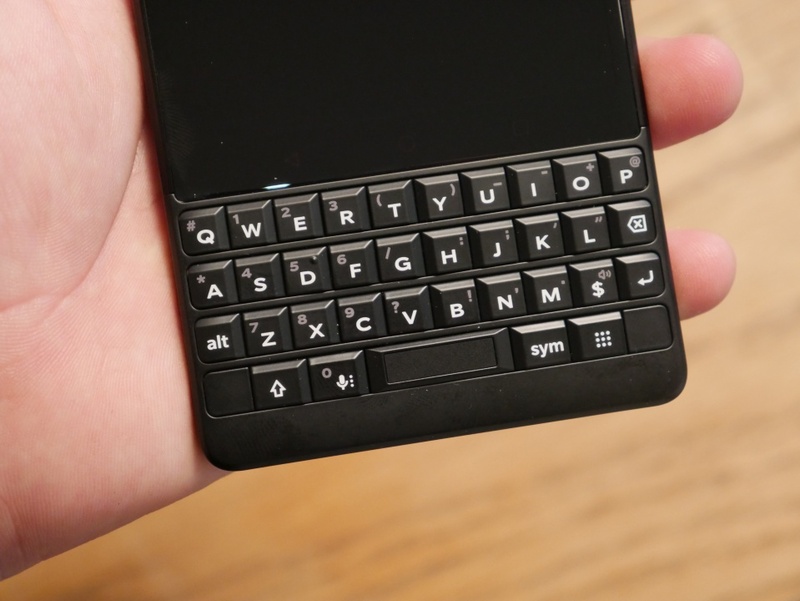 I’m told that whilst it looks nice, it’s actually really hard to get that seam perfect, and that when people dropped their KEYone’s, the back panel popped open those clips, this new design stops that, neat. Also on the rear is the new camera setup. 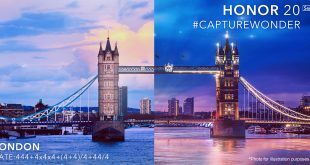 The KEY2 goes from a single 12mp sensor to dual 12mp sensors, one of which is a 2x telephoto one. In my quick hands-on, the zoom seems to be pretty great, and the speed of the camera is far better than the KEYone and miles better than the Motion. Camera quality, from the small samples I took, looked great (I wasn’t able to take them off the device) and I’m excited to do a bit more long-term photography on this. 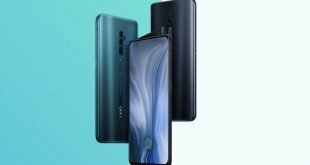 What about Specs? We all love specs. 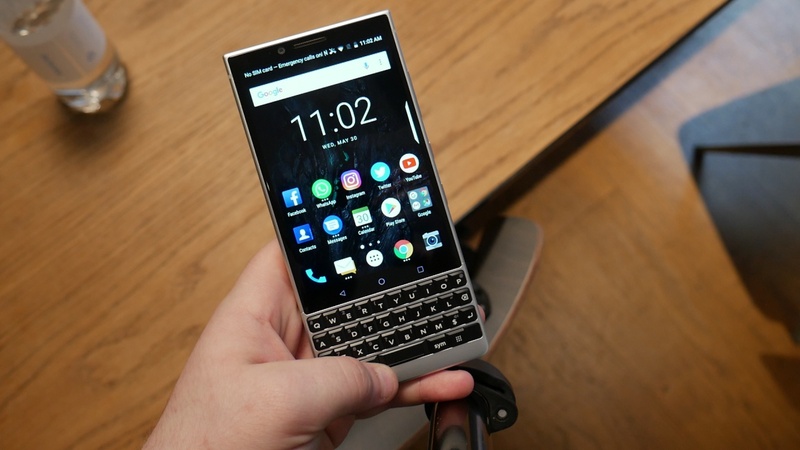 The KEY2 has a lot of them, nearly all of them are improved over last year as well. The Processor gets a substantial boost from the Snapdragon 625 in the KEYone to a Snapdragon 660 in the KEY2. RAM also gets a bump from 3GB in the standard KEYone and 4GB in the Black Edition to 6GB in the KEY2. Storage to foolow suit with 64gb as standard, and 128gb as an option, with a MicroSD slot capable of supporting 256gb MicroSD cards. 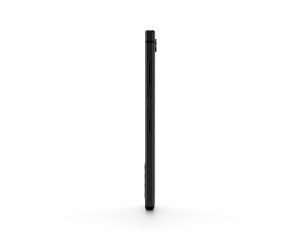 BlackBerry also managed to keep basically the same capacity battery (5mAh smaller) but shrinking the Z height by almost 1mm, now that is impressive. All of this is wrapped up with software. The KEYone was a stellar phone for security software updates, but platform updates? Well, it’s still on 7.1.1. That’s not the end of the world as 7.1.1 is still relatively recent, and I’d rather get security patches than nothing. However the KEY2 launches with Android 8.1 out of the box, which means Project Treble is mandatory. The KEY2 also uses a Snapdragon 660, which Qualcomm has said is already feature complete for Android P, so there is a very high chance that the KEY2’s software situation will be a lot better than that of the KEYone. A Wild Alex Dobie Appears! If it wasn’t obvious, I’m pretty excited about the KEY2. I loved the KEYone, and BlackBerry fixed pretty much everything I had an issue with, and even things I didn’t know I didn’t like, so kudos to them. 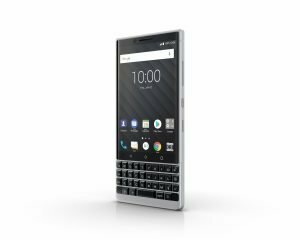 The only thing that is a little hesitating is the price, the KEY2 will cost £579/$649 USD/$849 CAD/€649. that’s a noticeable chunk more than the KEYone, but the KEYone sold remarkably well, for the first 4 months or so they could barely keep up with demand, and I think enough has changed for the KEY2 that people would consider buying it, even at it’s increased price.